Natural Calm Magnesium Citrate ionic formula absorbs quickly to balance calcium and relieve symptoms of magnesium deficiency like insomnia, headaches, muscle pain, constipation. Ideal for kids to help with sleep, growing pains and ADD. Children (1-3 years) - 1/4 teaspoon daily. Children (4-8 years) - 1/2 teaspoon daily. Adolescents (9-18 years) - 1 1/4 teaspoons daily. The kids have never slept better! My 4 year old daughter requests the raspberry lemon flavour every night before bed. Itâ€™s become our bedtime ritual. The drink helps to calm and relax her for a more settled sleep. My daughter doesn't care for the flavor. Some of my kids like the flavor, some don't. All four have learned to drink it. But my 7 year old has quit complaining about headaches and leg cramps since we've been using Calm. 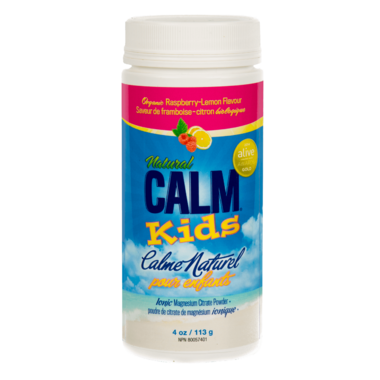 Also, after trying one other brand of magnesium, I've found that the Calm brand mixes into liquid thus getting into the kids and the other brand doesn't instead it just sits in the bottom of the cup. I'm really happy with Calm. I wanted to love it, but my kids donâ€™t like the taste, so I have no idea if it works or not. Love this stuff for kids and adults! Great tasting and works well. I got it for my niece who gets leg cramps at night. I enjoy the adult version, especially for leg cramp prevention (along with other benefits) while pregnant.